From internal systems to the growing range of customer-facing digital platforms, having an optimised data centre or virtualisation strategy in place will be central to banks' success as they move towards an increasingly digital future. EMEA vice-president and general manager, financial services at Hewlett Packard Enterprise David Lander tells Future Banking how banks striking the right balance when guarding against the worst security breaches is essential, but so too is minimising downtime and reducing energy consumption. Taking the strides needed to overhaul legacy data systems can be a daunting task for financial institutions given the expense involved and the need to choose from a range of options. But with a throng of fintech companies eager to step in and provide customers with the flexible digital approach they desire, established banks must take a leap of faith if they are to retain customers in today's digitally oriented environment. As banks expand their customer-facing platforms to include a range of banking apps and mobile payments, the huge volume and variety of data flowing from multiple channels creates a need for greater storage and agility. In achieving this, banks must decide whether to continue to invest in and augment their existing data centres - or to move to a cloud-based system where operations are managed in a facility external to their business. According to David Lander, EMEA vice-president and general manager, financial services at Hewlett Packard Enterprise (HPE), a definite trend towards the latter is emerging. "What we're seeing today is most businesses opting to take the cloud-based approach," he says. "It's widely recognised that, in the current climate, investing in an owned data centre is no longer wise," he says. This eagerness to move away from company-owned-and-managed data centres is in part accountable to the scale of investment required to create a facility capable of the high levels of connectivity and availability necessary to meet today's requirements. The substantial cost here in fact stems not from the price of the physical IT equipment itself (comparatively low in terms of the life cycle of the project) but rather from the high costs associated with the facility itself. "From the connection to the power grid and network, facilities management and uninterrupted power services (UPS), all of this is essential," Lander says. "Companies such as HPE make huge investments into these services as part of their overall business structure. Avoiding incurring these costs within your business means choosing the right cloud or infrastructure provider that will invest in these services on your behalf." In any new data centre strategy, companies are of course eager to mitigate the risks of downtime, damage to software and data losses. Critical to doing so is understanding what triggers them, and in most cases human error plays a part, Lander reveals. "This is often in the form of either a well intentioned intervention or a mistake in managing and operating complex systems," he says, "or on request of implementing some form or change." To overcome this, a strict regime regarding change management is required together with a standard set of well-documented processes. Automation can also be hugely beneficial within the operation of mission-critical systems. "Where manual action is required, procedures and processes need to be well documented and well understood," Lander says. "The automation of processes is paramount to protecting the integrity of applications and reducing risk of downtime or failure loss, and cloud automation is increasingly at the fore of every client discussion." He continues, "If we look at data loss, this often happens in one of two ways - data being moved around and being shared through traditional means, leading to it being misplaced or lost; or a cyberattack, where data is accessed illegitimately. "As we see in the news on an almost daily basis, cyberattacks are extremely prevalent. It's no longer a case of if a business will be hacked, but when, and companies need to implement appropriate security systems to minimise the risk and mitigate the impact." In ensuring data centre infrastructure will be able to meet requirements like security, a programme of rigorous testing is essential at the time of commissioning. This is something that HPE takes very seriously, implementing tests focused on the facility itself, the engineering ability, the infrastructure, network, facility management and, of course, security considerations. "A data centre creation programme plan requires significant investment and time to create, enable and launch with the first applications switched on safely and robustly - be these cloud or traditional applications. "HPE has a proven track record in ensuring our data centres are fully tested prior to go-live so that we can successfully support the first tranche of customers in our centres. We recognise the significance of a safe launch for our customers and ensuring data centre provision is key to this success." On the environmental side, HPE complies with the EU Code of Conduct for Data Centres, and also meets the absolute requirement of several of its clients to provide environmental accreditation to ISO 14001. It's a consideration built into HPE's ethos and manifests in its efforts to reduce energy wastage. "One of our primary design drivers for data centres is to improve efficiency, without compromising resilience or security," Lander says. HPE's efforts include efficient data centre fabrication design to reduce power and lighting requirements; and optimisation of medium voltage electrical distribution system to minimise electrical transmission losses, while still maintaining resilience and availability. It also makes use of cool external air to maintain proper temperatures and humidity with minimal impact on energy consumption. With these safeguards in place, banks can opt to run data centre services through HPE with the peace of mind that experts are on the case. HPE debuted in November 2015 as a $53-billion enterprise technology company but draws upon its decades of experience in banking technology as part of Hewlett Packard. "We have over 35 years of experience in this market, spanning banking, investments, building societies and insurance," Lander says. "Of the world's largest banks, 94% of them run their IT infrastructure on HPE software; every five seconds, somewhere in the world, HPE processes an insurance contract; and 130 of the world's stock and commodity exchanges are powered by us. We are exceptionally proud of what we've achieved in this sector." HPE's recent quarterly results, published in May 2016, showed revenue at $12.7 billion, with a promising 35% of net revenue coming from EMEA. Lander points out that one of the big advantages of a cloud-based approach in partnership with a company like HPE is that it gives financial institutions the best chance of being equipped to meet changing requirements over time. Banks that own their own data centre facilities face the challenge of the infrastructure not proving to be sufficiently scalable or flexible over time, as needs change. Entrusting these concerns and this investment to an outside partner like HPE, allows clients to focus on their core business. "Customers and businesses are seeking different things from future-proofing and embracing cloud. The most significant aspect of future-proofing is aligning on the rationale for the journey from the onset, rather than simply following IT trends," Lander says. "Investment levels in data centres and cloud are not insignificant and therefore it is important to recognise what you need to invest in, how you finance and secure those services and from whom. Most businesses view their data centres as mission critical - and they are. It is crucial any decision to future proof recognises this." HPE works with a range of customers, in some cases to support a traditional IT environment, but for the most part helping customers transition to a cloud-enabled or hybrid infrastructure. It provides a variety of service level agreements (SLAs) to cover its wide range of services, and can tailor SLAs to clients' requirements if needed. Lander advises banks seeking a secure, mobile-friendly and adaptable infrastructure to choose a partner with a demonstrable record of providing large-scale data centres and cloud, and to work with them to establish a clear picture of the transformation journey their require. For HPE's own customers, this close collaboration is par for the course, Lander says, and central to the company's attractiveness over competitors. "HPE has great industry sector knowledge, not only in financial services but also across a range of industries, which helps drive innovation as concepts and outcomes can be applied, and lead to improvements," he says. "At the same time, the breadth of our capabilities and solutions cover all traditional domains such as business, application, data and technology. Both of these factors are also complemented by our integrity as a business and the way we work with customers. "We always work hard to establish a genuine partnership where the relationship is mutually beneficial and we believe customers respect that." 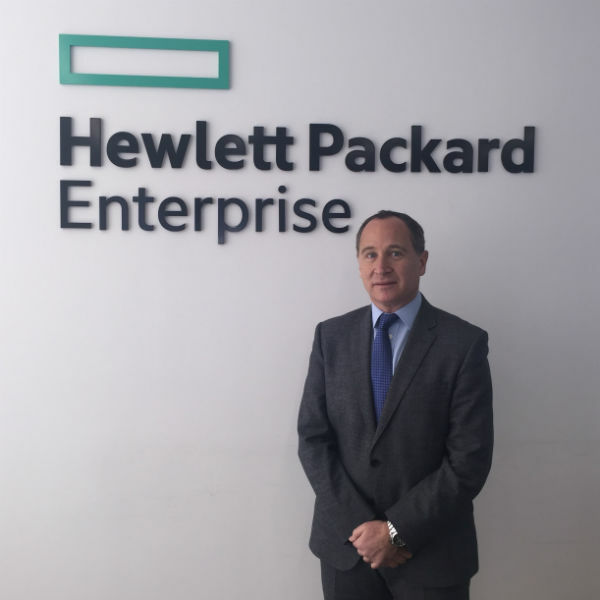 David Lander, EMEA vice-president and general manager, financial services at Hewlett Packard Enterprise.